Will state of emergency crash France's ailing economy? 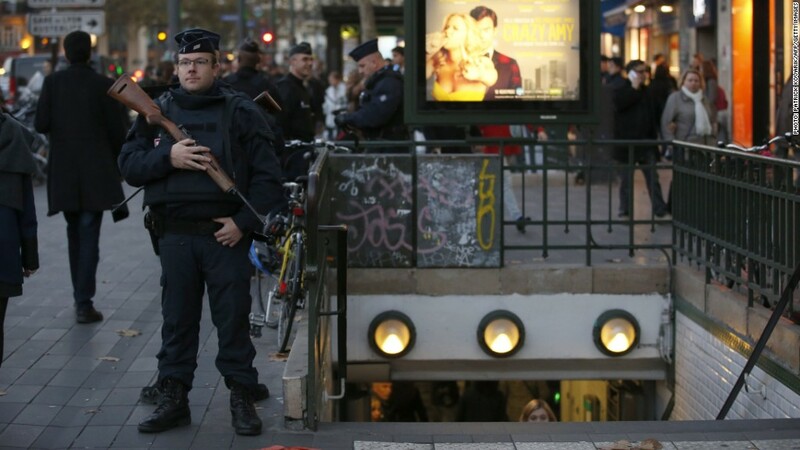 France's fragile economy was showing signs of recovery before the deadly attacks in Paris. Now the country is at risk of returning to stagnation. The government declared a state of emergency after terrorists killed 129 people on Friday. The lower house of parliament on Thursday backed President Francois Hollande's call to extend that for three months, and the upper house is likely to do the same Friday. The emergency gives police special powers to stop and search people, restrict movement, enforce house arrests and prohibit mass gatherings. 1. Anemic growth: France has only just returned to growth. Its economy grew 0.3% in the third quarter, after stagnating in the second, and was expected to grow by just 1.1% this year. The nature of the venues targeted by terrorists last week -- bars, restaurants, a theater and stadium -- could keep people away from public places. Any slowdown in spending following the attacks could wipe out growth in the final quarter of the year. 2. Anxious tourists: France is one of the world's top tourist destinations, attracting nearly 84 million visitors a year. But the prolonged state of emergency could make some travelers uneasy. The U.S. and Canada are telling people to be more cautious if they visit France. Australia has advised its citizens to "reconsider their need to travel" to Paris following the attack. Britain has said schools should cancel trips planned for this week. The attacks on Charlie Hebdo and other targets in Paris in January prompted some tourists to stay away. Eurostar, the company that operates trains between Paris, London and other major European cities, said a fall in revenues in the first half of the year was partly due to those attacks. France is pushing for much stricter controls at Europe's external borders. That would inconvenience tourists. Much more serious would be the restoration of border controls within Europe -- even if only on a temporary basis. That would hurt tourists, businesses that rely on trade, and people who live in one country and work in another. 3. Loss of confidence: The tragic events of last Friday might make people more cautious about their money. That would hurt the economy, because France's growth is largely driven by consumer spending. Prolonging the state of emergency will not help sentiment. "People might suddenly realize that things are worse than they thought," said Jennifer McKeown, senior European economist at Capital Economics. "On the other hand, the strong reaction of the French government could reassure them." 4. More debt: The government is boosting its defense and security spending, for example by hiring at least 17,000 new staff, including 5,000 police. That could put France at risk of running higher than expected budget deficit, which could push the cost of borrowing up. "We are not projecting any significant increase in [bond] yields, although they may go up if the deficit increases markedly as a result of higher security spending," said Diego Iscaro, senior economist at IHS. 5. Populist policies: The attacks may also lead to a shift in the French politics. President Hollande's popularity has been hovering near record lows all year, and the attacks could give a boost to the far-right National Front. That could force mainstream parties to abandon plans for economic reforms. "There could be support for more protectionism, more government spending, labor reforms reversal, and all that could affect growth," McKeown said. There could also be a backlash against migration. Despite all the problems France is facing, economists expect any impact on the economy to be short lived. Similar attacks in Madrid in 2004 and London in 2005 were followed by dips in activity, then a strong rebound. Angela Merkel at G20: "We are stronger than any form of terrorism"